Just how great is the Great Wall? People who visit the Great Wall at Badaling in Beijing often mistake it as the only section of the wall that is open to tourists, or even representative of the whole span of the Great Wall. However, this architectural wonder spreads over tens of thousands of kilometers through China's countryside. Built over 2,000 years ago, the Great Wall was constructed by dozens of dynasties in history including the Warring Period (475BC-221BC), the Qin Dynasty (221BC-206BC), the Tang Dynasty (618-907), until finally, the Ming Dynasty (1368-1644). The wall stretches 21,196 kilometers and snakes through 403 counties in 15 provinces, municipalities and autonomous regions. Unlike the maintained Great Wall at Badaling in Beijing, the focus of most tourists, other sections of the wall have been corroding from the effects of nature and negligence. Getting to the Great Wall section at Changcheng town, Wuqi county in northwest Shaanxi Province is not easy. Lured by the idea that this area of the Great Wall was built during the Ming Dynasty and is the beginning of the Great Wall within Shaanxi Province, adventurous tourists often venture here. But after hours of climbing hills, most find themselves lost amidst massive plateaus, with the wall nowhere in sight. "We have many travelers come, but we have to guide them through," said Feng Huoyu, a local official at the town of Changcheng. "Like today there were around 50 visitors," he told the Global Times. As more research about the wild sections of the Great Wall is revealed, interest in these sites rise. After four hours journeying from Wuqi county to the site, travelers were surprised when they finally saw the section of the Great Wall. It would have been difficult to spot, were it not for the big beacon tower. The majority of the wall had disappeared, after years of abandon. The exterior bricks and tiles outside the wall were eroded. "There aren't any protection measures set, but there will be soon," said Feng. "Bureaus at the county and provincial levels will send experts over to repair, and our town government will patrol the wall, prohibiting damage from visitors." Along the mountain road to Changcheng town, new roads were being built by heavy machinery. "Traffic here is not convenient. New roads are being built to facilitate locals and tourists. We are applying to develop this section of the Great Wall as an official scenic spot," Feng said. Whether or not to further develop sections of the Great Wall into scenic spots is a dilemma facing the government. Money generated from tourism could sustain its preservation. But if it is developed, these sites face human destruction. In 2003, part of the Great Wall at Hongyukou, Tangshan city in northern Hebei Province was destroyed in order to build a scenic area. The Great Wall at Shahukou, in northern Shanxi Province was once a historical gateway in central China. It was developed as a scenic spot in 2003, with efforts from the local government. However, during construction, the original walls and mounds were replaced with modern brick walls. The sides, pass and arch were all recreated, disregarding historical accuracy. "They disrupted the original," Luo Zhewen (1924-2012) a well-known Great Wall conservation expert, once stated to the public. During the Cultural Revolution (1966-76), many parts of the Great Wall were destroyed, in efforts of ridding the "four olds" (old customs, old culture, old habits and old ideas). After the movement ended, conservation efforts for the Great Wall began in the early 1980s. Enthusiasm for the field surged in the late 1980s. "The massive destruction of the Great Wall caused by its (commercial) development started in the late 1980s," said Cheng Dalin, an expert on the protection of the Great Wall from the Chinese Academy of Cultural Relics, in an interview with Southern Weekly in May. "Tourism aside, mining, road building and other industrial activities are destructive factors," Cheng said. "The majority of the Great Wall is unprotected," said Duan Qingbo, vice president of School of Cultural Heritage in Northwest University in Xi'an, Shaanxi Province. "Keeping them from human destruction and starting regular repair projects on sections is what we can do for now," Duan told the Global Times. "The government is currently cautious of turning sections of the Great Wall into scenic spots," he said. "Ticket revenues may not be as high as expected, and increased tourism destroys parts," Duan explained. Most cultural relics hardly make money once they are scenic spots, except significant sites like the Forbidden City, Terracotta Warriors and the Great Wall at Badaling. "The fondness over turning cultural sites into money-making centers needs to change," said Duan. "Those cultural relics are far more significant in cultural and historic research, and we can't expect the tourism revenue to sustain their preservation," he added. Take the Great Wall as an example. It used to serve as a military defense against enemies, but it also represents Chinese civilization and cultural interactions between agricultural civilization and nomadic cultures, as well as the cultural conflicts within each of those cultures. 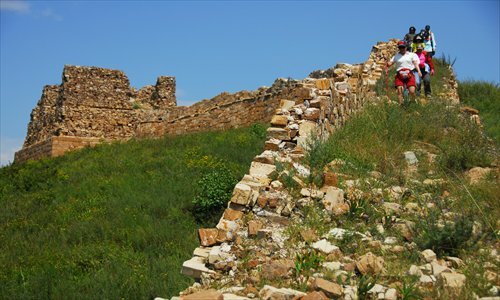 "The Qi Great Wall (in eastern Shandong Province) was built to separate different agricultural groups, and the Jin Great Wall (in the Inner Mongolian Autonomous Region) separated nomadic peoples," Duan said. Another problem is the protection and preservation mechanism, according to Duan. "We don't have an institution specializing in the Great Wall, and there are few private organizations."